Common Ground Art Fair Birmingham 2018 – The 2018 Common Ground Art Fair will be held on in Downtown Birmingham. The event is a fundraiser for the Common Ground non-profit. This year’s event will take place from 10a-6p on Saturday, September 15 and from 10a-5p on Sunday, September 16. This exceptional art fair will host more than 140 artists from across the country presenting their handmade artwork in ceramics, painting, photography, glass, jewelry, sculpture, wood and more. The Common Ground Art Fair Birmingham 2018 artist booths will be on Old Woodward south of Maple Road, part of the vibrant street scene in beautiful downtown Birmingham. 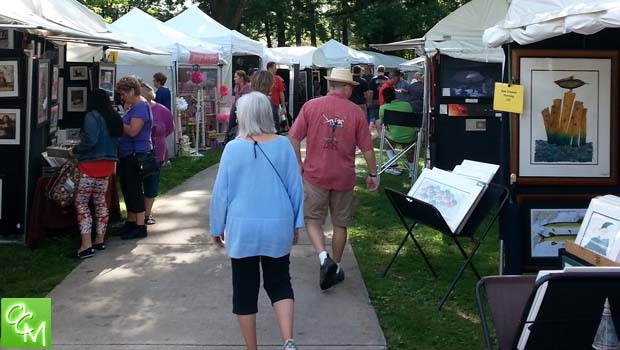 This exceptional art fair serves as a major fundraiser for the outstanding work of Common Ground, Oakland County’s nonprofit agency providing emergency help for families in crisis. Common Ground Art Fair Birmingham 2018 admission is FREE and there is convenient parking throughout Birmingham. In addition to artist’s booths, the Birmingham Street Art Fair features the annual art auction benefiting Common Ground. All artwork in the auction tent has been donated by the artists participating in the event. Common Ground is a nonprofit crisis intervention agency serving Oakland County youths, adults and families in crisis. The agency presents the Birmingham Street Art Fair (also known as Art in the Park) annually as its principal fundraiser. See our Events / Things To Do tab for more events, activities and things to do in Oakland County and Metro Detroit, Michigan.